People across the country are screening the Fire Under the Snow DVD in communities and house parties to inspire people with Palden’s story and raise awareness about Tibet. 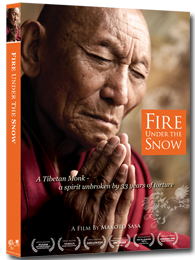 We continue to encourage organizations like Tibet support groups, religious groups, yoga studios, meditation centers, youth groups, care houses, grassroots groups, and individuals across the country to organize screenings, house parties and actions around Fire Under the Snow. The film has inspired many people to get involved with Tibetan issues themselves, and to start taking action. Join the campaign and let your representatives and community leaders know how you feel about about Tibet. By creating a climate of empathy and understanding around the issue of Tibetan cause, we can lay the foundation for change. 1. Host a screening or house party! Your screening event can help advance your group's mission, grow your membership, and even help you fundraise - all while building support for Tibet. In this page you'll find all the tools you need to make your screening an easy-to-organize successful event. 2. Purchase a Screening Kit for community screenings and house parties. 3. Download a free Community Screening Planner, and begin planning your event. Click Here to find a sample press releases and everything you need to organize a successful event with Fire Under the Snow. 5. Send an e-mail, share a short web video and spread the word! Send an e-mail to your friends or to your lists to share one of our short web videos or to let them know about the Screening Campaign.